Click the Start button and type netplwiz in the Search box and press the Enter key. Click Continue when the User Account Control window appears. 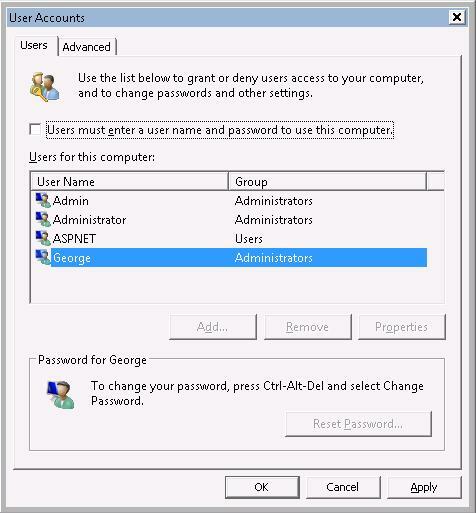 At the User Accounts window, click on the user name you want to automaticaly logon. Just uncheck “Users must enter a username and password to use this computer” option and click OK. Enter the user’s password. To test, just restart your computer. If Windows Vista ask you for a password, please, check the procedure above. In the Open box, type control userpasswords2, and then click OK.
Clear the “Users must enter a user name and password to use this computer” check box, and then click Apply. In the Automatically Log On window, type the password in the Password box, and then retype the password in the Confirm Password box. Click OK to close the Automatically Log On window, and then click OK to close the User Accounts window.